Congratulations! You win 66 bonus points with this purchase! Perfectly comfortable - love them! Means I don't have to use my reading glasses any more! Monthly presbyopia-correcting contact lenses from CooperVision. 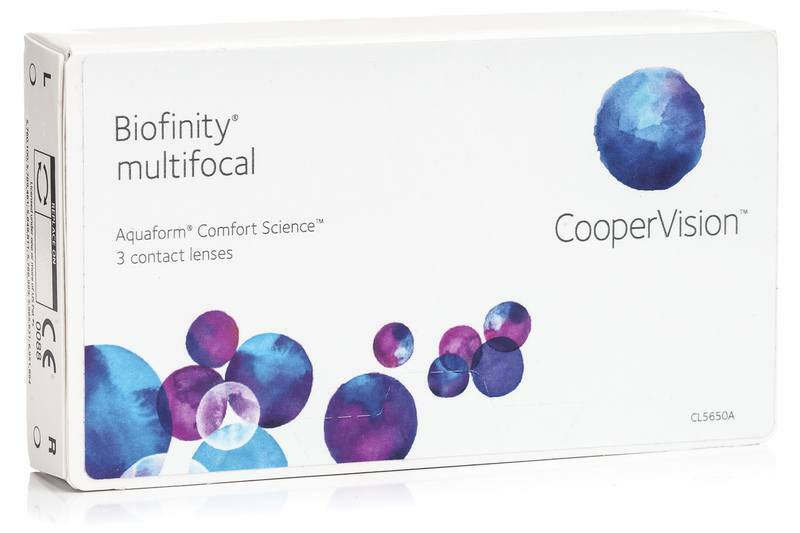 Biofinity multifocal use a unique Aquaform Technology lens material, and Balanced Progressive Technology to help ensure eyes receive plenty of oxygen, and vision remains in sharp focus. The lenses stay moist without eye drops and enable near and far sight and everywhere in between. They can be worn for up to seven days continuously. It says 3 lenses per box, is that 3 pairs of lenses or 3 individual lenses. Please send us the prescription to see exactly what the doctor recommended you. See the attached photo as well. Please keep in mind that those lenses can be worn for up to seven days continuously. Hi, You can wear these up to 7 days continuously! Thank you! Hi, These are described as "monthly lenses, as there are 3 lenses in a box, does this make each box a 3 month supply or do I spread all 3 over a 1 month period?? Thank you. Hi! Each lens will last you one month! Thanks! !